Después de publicar los 50 ejemplos de Tag Questions en todos los tiempos verbales y el articulo en que expliqué qué son y cómo se usan estas preguntas de confirmación o Question Tags en inglés, ha llegado el momento de que practiques lo aprendido con el complemento definitivo de la guía de Tag Questions: Un conjunto de ejercicios para resolver y que vas a tener la oportunidad de descargar a tu computadora e imprimir. Espero que hayas estudiado bien las lecciones. 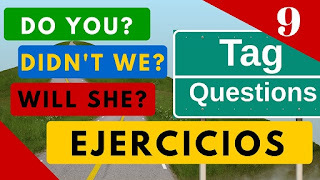 A continuación y sin más dilación, dejo los ejercicios de Tag Questions en inglés divididos en los apartados que se mostraron en la Guía. Al final de estos sets de ejercicios voy a colocar el video, el PDF que puedes imprimir y las instrucciones de descarga del archivo. Julia is beautiful, _______________ ? Kevin doesn't speak Spanish, _______________ ? He has been saving money for many years, _______________ ? Christian and Anna are not living in New York, _______________ ? You haven't experienced any problems with the software, _______________ ? Walter likes comedy movies, _______________ ? You and I are intelligent, _______________ ? You don't believe in miracles, _______________ ? I am the only one here who loves classic music, _______________ ? Melissa has not cleaned the bathroom, _______________ ? Rebecca and Justin were business partners, _______________ ? Jack was not trying to find a solution, _______________ ? She didn't achieve great success in this company, _______________ ? You had written half of the book by the end of april, _______________ ? Little John had been crying for hours since I left, _______________ ? We decided this together, _______________ ? You didn't finish the exam, _______________ ? The stores had closed by 9 PM, _______________ ? They were not paying attention, _______________ ? Elizabeth reviewed the presentation with the team, _______________ ? Benjamin will sell his house, _______________ ? Amy is not going to take this class, _______________ ? Megan and Jeff will not travel to China this month, _______________ ? My new office is going to be nice, _______________ ? You will contact the suppliers, _______________ ? Richard is going to be working hard tonight, _______________ ? Emma won't consider the offer, _______________ ? We are going to watch a movie this weekend, _______________ ? David will have written the essay by 9:00 PM, _______________ ? By friday, Rachel is not going to have been attending classes this week, _______________ ? Alexander could support the project, _______________ ? You can finish the presentation, _______________ ? She should meet more people, _______________ ? Paul can't ride a horse, _______________ ? Jennifer might not move to England, _______________ ? She must go to the dentist tomorrow, _______________ ? Tony shouldn't go on a diet, _______________ ? I wouldn't hurt your feelings, _______________ ? The employees may not leave early, _______________ ? The students mustn't use a calculator for this test, _______________ ? Let's play chess, _______________ ? Don't eat many candies, _______________ ? Follow the rules of the game, _______________ ? Let's watch a documentary, _______________ ? Don't forget to feed the cat, _______________ ? Forgive me for my actions, _______________ ? Let's not damage our relationship, _______________ ? Don't drink and drive, _______________ ? Let's not start a fight,_______________ ? El video de esta lección va a ser publicado en este mismo artículo cuando esté disponible en mi canal de YouTube "Yes en Inglés" al cual puedes suscribirte desde este enlace para estar al tanto de las actualizaciones de este y otros temas para aprender inglés. Ahora, no los voy a dejar solos. Todas las respuestas correctas de los ejercicios mostrados aquí también van a ser publicadas en video. De igual manera, y como hago con todo contenido que publico en el blog, lo compartiré en un enlace vía mi página de Facebook: MrCarranzaESL. Like please. Sin más por el momento, que tengas un día genial. Gracias por compartir tus conocimientos y valioso tiempo con nosotros, he aprendido mucho..